The word “hack” seems to have a very negative connotation these days, seemingly always associated with big company data breaches and malicious foreign governments. 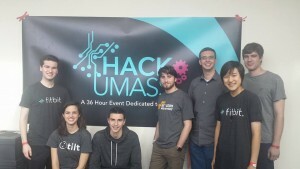 This past weekend, however, the campus saw the positive implications of the word, as over 500 students from across the country traveled to campus to attend HackUMass, the 3rd annual hackathon at Umass. Congratulations to all of the participants at HackUMass III ! So what is a hackathon? Well, as a computer science student, I like to solve problems. These days it seems like there very few things that can’t be improved or made more efficient by some sort of technical solution. At any hackathon, like this past weekend at HackUMass, students break up into teams to create a technical solution to a problem. This weekend, each team had between midnight Friday and noon Sunday to build, design, and troubleshoot their solution. Most teams worked through the 36 hours without much, if any, sleep. 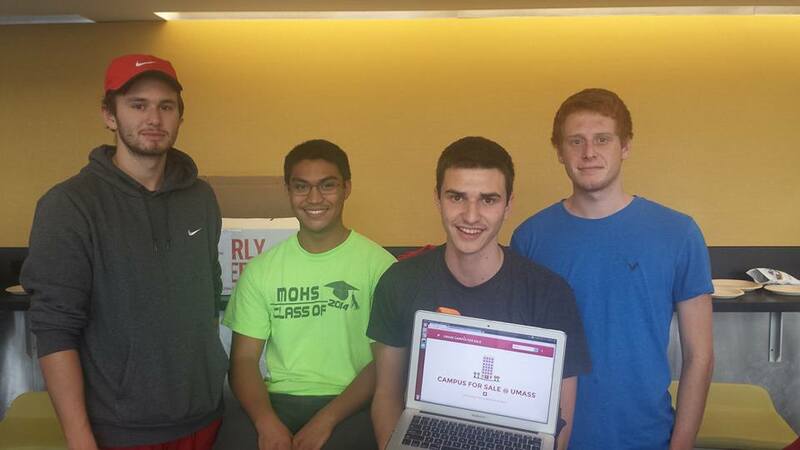 Help Center Consultant Andrew B. and his team for their project “Campus for Sale”. My team hit Facebook to search for inspiration of what to build. We ended up on the UMass ‘Free and For Sale’ group and began looking through the posts there. Here, students can post anything and everything they are looking to sell to other students on campus. It seemed like a sort of Craiglist on Facebook. Here’s the issue though: Facebook is a social media platform. It’s simply not built for this sort of thing. Items that are posted disappear as more posts are made after it. You can’t easily search for items you are looking for, and there is no sort of filtering or category search. We knew we could build something better. The categories featured on the homepage. Armed with just our laptops and an endless supply of Redbull, we set to work in our cozy room in the Integrated Learning Center (ILC). 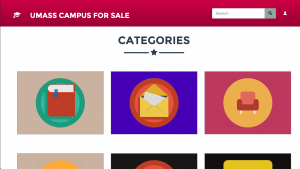 Our project, CampusForSale, was going to be a website that let students buy and sell items on campus. We thought it was important for the website to only allow students to post items, as we wanted to make sure it was as easy and safe to pickup items as possible. Most of my team had never done any web development before the event, so we took a divide and conquer approach. Two of us worked mainly on the back-end database and search functionalities, while the other two worked on the front-end website. In order to make it more useful than it’s Facebook counterpart we made sure that you could search for items, and browse listings by category. This page shows all the listings in a certain category. Other teams worked on hardware projects, some involving various sensors, LEDs, and embedded computers. You can view other projects that teams worked on at http://hackumass-iii.devpost.com/submissions. 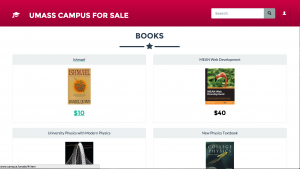 Over the course of the weekend, each of us got only about 4 or 5 hours of sleep total, but our prototype of the site was live at http://www.campus.forsale by noon on Sunday. After an initial round of judging, CampusForSale was selected as a finalist and we got the opportunity to present our project at the closing ceremonies! Now we’re all off to bed until HackUmass 2016. This entry was posted in Web and tagged hack, umass on October 26, 2015 by arbass. Welcome class of 2019! What you need to know about IT at UMass. UMass Amherst IT would like to welcome the incoming freshman class to campus! As you move in and go through the first week of classes and fall New Student Orientation, you’ll discover the countless web services and technologies used at UMass Amherst. We see many freshman coming into our Help Center during this time to ask questions, and we are here to help in the Lederle Graduate Research Center lowrise, room A109, from 8:30 am – 4:45 pm (the building right across the street from Northeast dorms on the first floor), as well as the W.E.B DuBois Library Learning Commons during the day and after hours until midnight. 1.) How do I connect to the wifi? Access to the wireless network is vital for any student living on campus, and is one of the first things you may do after moving in. You will see two networks in most areas of campus, “UMASS” and “eduroam”. 1.) Connect to the UMASS network. 2.) Open a browser (Safari, Chrome, Firefox, etc.) and try to load any web page. You should be redirected with a “wireless at UMass Amherst” page with a yellow rectangular “eduroam” button near the top. If you do not see this page, type login.wireless.umass.edu into your browser to view the page directly. 3.) Click the yellow “Connect to eduroam” button at the top of the page. 4.) Enter your netid and password on the Web Login portal and follow the instructions. Android – connect to eduroam (note: many find the manual configuration easier and faster to set up for Android devices, however running xpressconnect is still an option if you choose to do so). Windows Phones are unable to connect to the eduroam network due to their lack of support for TTLS. We would advise Windows phone users in need of a network connection to use UMASS, however keep in mind this network is not secure and will not keep you logged in for extended periods of time. Game Consoles are typically unable to connect to the eduroam network, however consoles with a regular web browser should be able to connect to UMASS by going to login.wireless.umass.edu. Please do not run the xpressconnect application for eduroam on your gaming devices, as it may cause problems with your device. UMass Amherst Information Technology is working on developing access for gaming devices in the future, however this project is ongoing and is still in early pilot stages. 2.) How do I check my email? Undergraduate students at UMass Amherst have Google Apps accounts. Students can check their university email by logging into Google Apps at apps.umass.edu with your NetID and password, or by going to mail.google.com and entering your NetID@umass.edu, which will redirect to the apps.umass.edu web login portal. Note that your NetID and Password are the same as what you use to log in to both Spire and Moodle and pretty much any other service at UMass. If you are having trouble logging into Google Apps, try the “Forgot Your Password?” link on the spire home page to reset your password. 3.) How do I get my email on my phone? To add your UMass email account to most mail applications, you will likely need to log in to your account in a web browser so that you can generate an application specific password for your device (phone, tablet, etc). Click here for more detailed instructions on this process and manual configuration details for Apps at UMass. However, if you are using single sign-on for Android or the iOS Gmail app, this article outlines the quick configuration process for these applications. 4.) How do I get Microsoft Office as a UMass student? Students can download Microsoft Office 365 for free by following the instructions in this article. Please make sure you follow the instructions carefully and remember the password you create when you sign up for office. Office 365 works for both Mac OS and Windows computers. 5.) How do I print on campus? The Learning Commons in the lower level of the W.E.B Du Bois Library and the Engineering Library on the second floor of the Lederle Graduate Research Center lowrise both have printers available to students, and other computer classrooms on campus also allow for printing. To print remotely, you can download and install the remote printing software to send your print request to any of these locations. You can also visit these locations and sign into a local computer and then print directly from that computer if you have your documents on a flash drive or in your google drive account. Students also have 100 free prints each semester, however if you need to add more you can pay with your UCard Debit account for $0.10 per page. The Printing FAQ article here explains how to pay for printing in more detail. 6.) How do I use the computers in the library and computer classrooms? You can sign into the W.E.B Du Bois Library Learning Commons and computer classroom machines with your NetID and password. However, you will first need to activate computer classroom access on Spire. After logging into Spire, go to Main Menu > IT Accounts > PC Classrooms and then enter your password and click “Enable Classroom Login”. After a few minutes, you should have access to the computers. This activation process should only need to be performed once, from then on you can log into the library computers whenever you need to. 7.) What antivirus software is offered by UMass IT? UMass IT offers McAfee to members of the university, available for download through the IT website. Link to download for Windows computers. Link to download for Mac OS computers. You will need to sign in with your NetID and password when accessing those links. After you log in, you should see a green button labeled “McAfee Security for Mac/Windows” which will download the software installer to your computer. Keep in mind that it is usually not a good idea to have more than one antivirus program on your computer. While having certain programs that are meant for virus removal such as Malwarebytes on your computer alongside antivirus programs is okay, if you already have an antivirus program such as Norton, a different trial version of McAfee, Avast, or AVG, you should uninstall those programs first if you would like to use the university’s McAfee download. More articles and resources are available on the IT website. We are also able to help answer any questions you may have or assist you with any of these topics in person for free in our Help Center in the Lederle Graduate Research Center room A109 from 8:30 am – 4:45 pm Monday through Friday or by phone at 413-545-9400. You can also email us at it@umass.edu with questions or use our live chat support by clicking the link under Get IT Help on our website. The Learning Commons also has a desk staffed with at least one IT consultant during the day in the W.E.B Du Bois Library. We hope you have a great semester and a wonderful Fall NSO this weekend, go UMass! This entry was posted in Apps and tagged Back to school, Freshman, NSO, Resources, umass, UMass back to shcool on September 4, 2015 by James D.